This is the Blue Orchid Blend brought to you by Huckleberry Roasters. 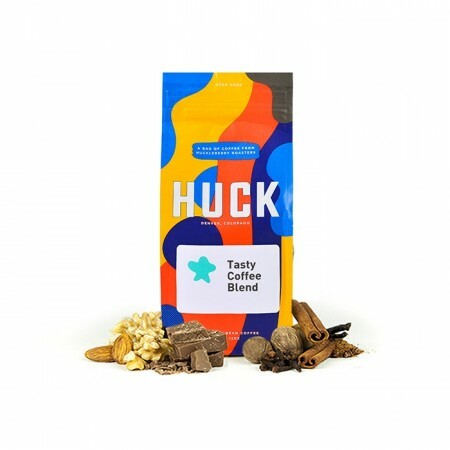 Huckleberry changes the components of this blend frequently, but they always try to maintain a sweet, full bodied, chocolate and caramel flavor profile by using Central and South American coffees specifically chosen for those qualities. This is great tasting comfort coffee and is a well-rounded crowd pleaser, it tastes great on its own or even with a bit of milk. Loving this. 18g, 35ml. served as a gibraltar. Sweet, balanced espresso goodness. Loved this one! I tend to enjoy anything Huckleberry does! They are alway solid! I’m not very good at describing coffee. This wasn’t my favorite but not sure why. Maybe it’s too dark or too acidic. It’s not as smooth as I like. I found this coffee to be true to its description. It was well-balanced with a stronger sense of chocolate than caramel, but still a very nice flavor to start my day. I do prefer a lighter roast this time of year. I very much look forward to my next shipment. This one is fantastic, I don't think I've had one this good since Metric Coffee. It is super well balanced, awesome flavor, and it's not overpowering. I would buy this again. Loved the full-bodied flavor and the hint of chocolate. Very easy drinking cup. Great well-balanced coffee. Love the flavor. Mellow, smooth flavor. Almost sweet, reminiscent of milk chocolate. Way to dark for pour overs / drip. Coffee was okay. Still trying to find that acidity I like. Good but a little more boring than the last one. For the last one I could really taste the blueberry - but of course this is a different type of coffee. I think for the next coffee can we have it a little less chocolaty? All three that you have selected are pretty chocolaty. We really Guatemalan coffee, usually pretty light roast. Ruby is our favorite roastery. Fine to good. I changed my coffee to water ratio slightly (fixed it, really) and it made a big difference. I'll try to break this down into a few categories: Branding, Roast, Taste. - Clean and bright! Catchy business name and a cool name for a blend. - Found a few quakers and a little unevenness in the roast. This could be because of the blend. - We felt that the Blue Orchid Blend didn't have a "thing" to call its own. No distinguishable aspect of the blend was able to shine through. Perhaps this is due to the roast or the beans chosen for the blend. Maybe this coffee was a little too "well-rounded" to be considered unique. It wasn't bad but wasn't amazing. Probably a little darker than I prefer. But my husband liked it a lot. Loved this one! It smells amazing and tastes fantastic! It's mellow but not meek. It's got great flavor! I am usually a sugar in my coffee kind of girl and I didn't even need sugar for this one. So good! Definitely am able to pick up on some chocolaty velvety notes in this coffee. Delicious pulling shots with this coffee but handles the pour over game as well. It was alright. nothing interesting. Very flavorful cup. Lighter than I expected but still a good chocolate sweet taste. This is one had my ideal balance of flavors and rich body. Wasn't great as espresso, but was fine as filter coffee. I preferred it on v60 vs Chemex as some of the oils lost in the Chemex filter helped the mouthfeel, in my opinion. Amazing. The best I've recieved so far. Well balanced coffee but is a more in the medium roast range. Probably would be a great espresso, but I mainly do manual brewing so lighter roasts "pop" more. Nice full body. Bold but round in flavor. Nothing crazy but definitely well balanced and I think this is a blend that meets the desires of the average American coffee drinker. I consider this a blend well done. Made great espresso. French press was just ok.
We found this coffee to be better suited to a pour over brew, instead of our usual French press brewing method of choice. It was light and easy on the palette, yet lacked depth and full flavor to be more than mediocre. We did taste hints of caramel, but not wowed by this particular roast. Good body, with silky feel. Smooth and mellow. Perfect for todays rainy day. Adds a nice bit of diversity to our list of favorites so far. This one slowly grew on me. At first, I thought it a little bland, although slightly improved in French press. But over time the beans mellowed a little more and I'm getting a nice caramely cup. Brews well. All round good balance and long lasting flavor. Not my favorite, but still a good roast. My favorite so far! Smooth without any bitterness-love love love it! Our favorite coffee so far! We loved it!! Best one yet! I really love this coffee and I must have more! Just okay as a cold brew. Have yet to try it V60 or aeropress. Pretty average. Not bad, not amazing. Kind of bland but well balanced. Super Good Coffee. My favorite so far! Tried a few different methods: Chemex, french press, but none of them seemed able to pull out the flavors promised. Can't say that we cared for this one too much. I actually thought it tasted slightly burnt. Brewing via French Press was the perfect suggestion. It was crazy how much the flavor changed. Very good coffee. The grind was a little more dense than other coffees which made preparing the espresso a little tougher, but when my shots were on, the caramel and chocolate notes prevailed. I would buy this again. I made this using a pour over method as I don't have a french press or espresso machine. Overall a decent cup of coffee, bold with a lot of flavor. This was a good cup of coffee. Pretty typical though, nothing spectacular about it, but it was a nice coffee to have to start my day. This is a great coffee. I was a little pensive because the label says it's an "espresso" roast and to use a "little cream", which isn't really my style any more. It's surprisingly balanced for these notes on the package. I've done an Aeropress 16g coffee :: 240g water..and Hario V60 30g :: 480g water...both brew up quite nicely. Good all around coffee. Brighter than I expected but that was welcomed. Otherwise true to its description. I really enjoyed this bean...bright and citrus yet had underlying caramel and chocolate nuances, excellent mouth feel and aftertaste. I made it with my Aeropress as double espresso. It was so-so as an espresso but OK when I used it for Americano. A fine cup, but not for me. Chalky maybe? Freaking amazing. Love pretty much everything about these beans. was disappointed with this coffee. Sorry did not care for his one. It's really good, smooth. I like the caramel notes. Of the three I received, this is my favorite. Nice cup of coffee. Still doesn't beat Cleavon Little Topeca, but I I like it! I really like this blend by Huckleberry roasters. It is very rich and complex. Definitely best brewed strongly or as expresso. Delicious! Perfect in every way! From the blend, to the roasting, to the packaging. I love the resealable bag and the roasting date. My new favorite espresso.